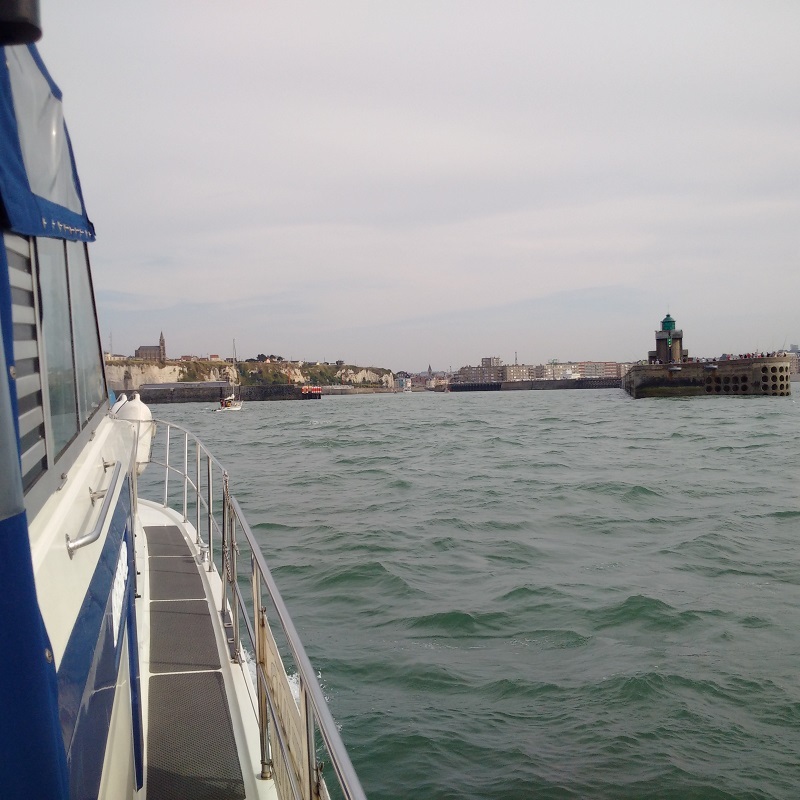 We planned and completed a good cruise from St Valery en Caux to Dieppe despite indifferent weather conditions. I had checked the weather from multiple sources and it was forecast for F4/5 from the north-east but I was expecting winds of just 9-11 knots inshore but with a 0.4-0.5m sea due to swell and past days winds and that proved just about correct when I monitored conditions throughout our 2hr30min passage. It was worse just outside St Valery and again rounding the Roches d’Ailly but throughout the cruise it was manageable, our speed averaging a knot faster than the slow 6 knots I had adopted for economy and we were perfectly able to have our hot drinks, sandwiches and snacks to pass the time. With our poor language skills, I thought that the harbourmaster had said that the gates would be opened at 5pm today. I had re-calculated the tides and passage timings over and over again, adjusting the boat computer time clock so that the MaxSea versions of tide times corresponded with those of external sources. As a result of all this, I worked out that the tidal gates should open around 3.45pm this afternoon and so I tried going over to the harbour office to check with them but they were closed. Luckily, there was another French skipper there and, although he could speak no English, we talked in French and he was able to confirm that the gates should be open by 4pm and so they were. I prepared on that basis and was just able to be ready and take the first bridge lift out of the inner harbour but it was short notice and therefore some time before Kathleen could manage all of the ropes and fenders and so I had to go on autopilot and help her in the end as we were getting into the swell beyond the shelter. 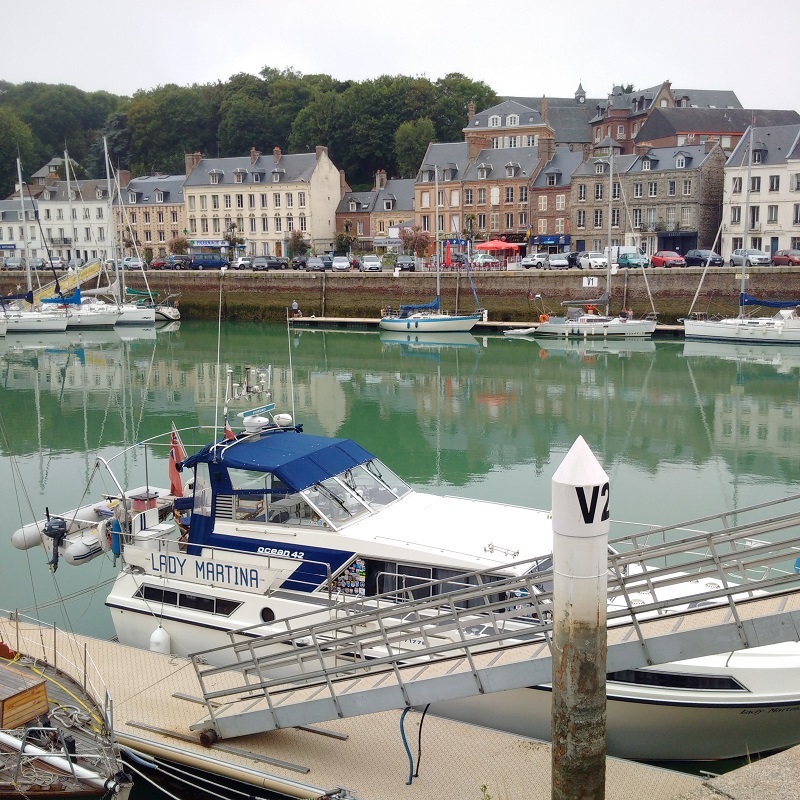 Both the exit of St Valery en Caux and the entrance to Dieppe were very straightforward and the Dieppe harbourmaster and the marina both answered me on VHF channels 12 and 09 accordingly. I was directed to a good berth alongside the main pontoon and the young assistant helped me moor with indications throughout. 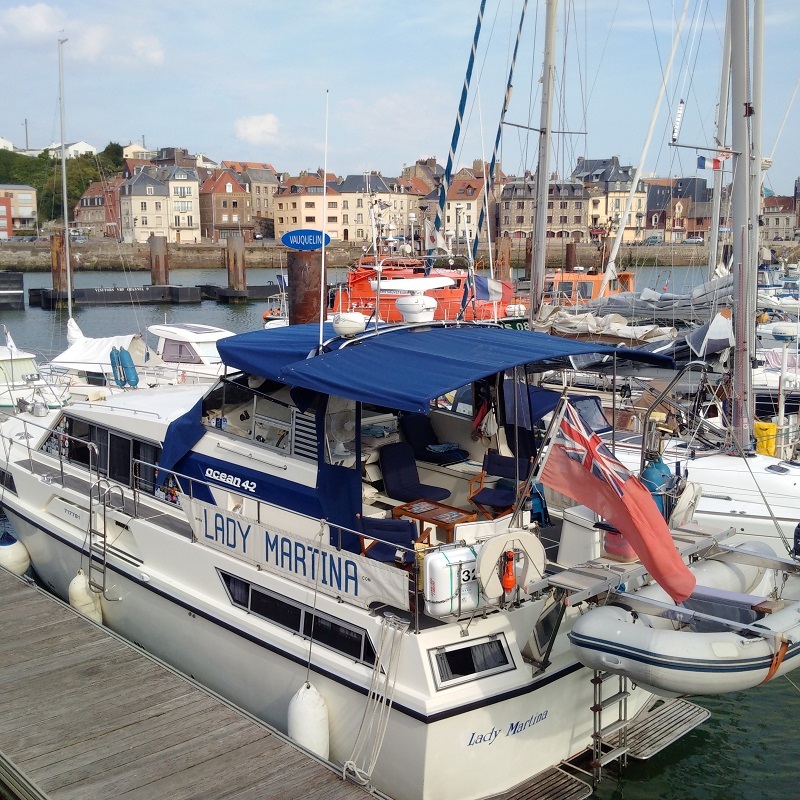 The marina office was a good cycle ride away but I found them there and speaking English well after Kathleen and I had given Lady Martina a good wash down.